Leather upholstery is a strong but supple material that does not stretch out of shape. It has a comfortable feel that stands up to daily use with minimal care. In the tanning process, dyes and a protective finish are added to reduce fading, cracking and peeling. Leather upholstery will last a lifetime, although without a protective coating it will scratch. For natural beauty, choose pure aniline leather. However, for more durability and scratch-resistance, pigmented leather is a better option. Leather is a durable upholstery option. Pure aniline leather is the softest and most natural-looking of all leathers. The natural markings of the hide are present, including wrinkles, scratches and branding marks. 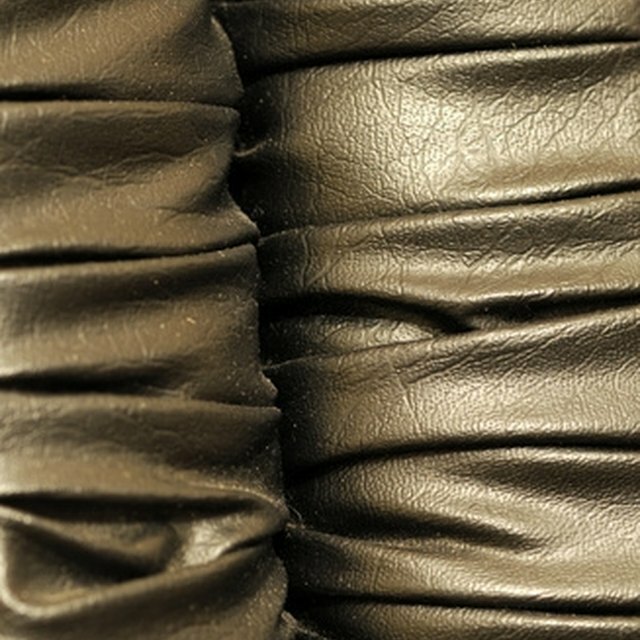 The leather varies in texture and color from piece to piece and develops a natural patina over time. The hide is dyed, but little or no protective coating is applied to prevent scratches or the absorption of body oils and stains. Pure and full aniline hides are the finest leathers available, and although the leather is durable, staining and scratching occur with time and use. Semi-aniline leather maintains its natural appearance but is more processed than pure aniline leather. A light surface coating and pigments are applied to offer protection, even out the finish and cover imperfections. The resulting leather is more durable than pure or full aniline, with a more consistent color and uniform appearance. Semi-aniline leather is a soft and durable high-quality leather that is resistant to scratching and stains. Pigmented, or protected, leather is the most durable leather for upholstery, but as a result of processing, it is less natural in appearance. A polymer coating with pigments is added that helps resist scuffs, scratches and fading. Pigmented leather is most commonly used in furniture and automobile upholstery because of its excellent durability. The grain of leather is an indicator of the amount of processing that the hide has undergone. Full grain leather is not sanded or buffed, showing the natural grain of the hide. Corrected grain leather has more processing, including sanding, buffing and pigmenting that cover natural imperfections. A decorative grain pattern may be embossed on corrected grain leather.